Do you have a MasterCard debit or visa card? Head over to Amazon.com today and save $10 on a purchase of $100 or more. Just add your items to your shopping cart and enter â€œ82YNNB5UTâ€ at checkout to get your $10 off! 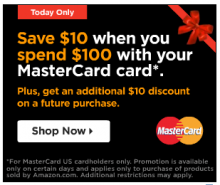 This offer is good today only for MasterCard customers. Head over to Amazon.com and check out their Cyber Monday deals still going on! Offers Dec 17, 2011 in Amazon, holiday, MasterCard · Expired!